The first Chakra is called ‘Muladhara’ Chakra or Root Chakra. ‘Mul’ means root and ‘adhar’ means support or foundation. Its developmental stage is from the time you are in the womb till the age of 12 months. A guided meditation to help you relax, de-stress, get balanced, bring in focus and connect with your higher-self. This deep meditation technique will also help enhance the positive energy in your space. The spine or the human energy field contains Chakra, or energy centers, that vibrate at different frequencies. Each Chakra presents us with the opportunity to establish a root relationship and to satisfy the deep soul desire. Each frequency holds the gift of a certain power, which enhances our human experience on Planet Earth. Chakras are wheels of light located all over our body. We have thousands of them in our body but the seven major ones are located along our spine from its base to the crown of the head. Each chakra is represented by a colour of the rainbow - red, orange, yellow, green, blue, indigo, violet. A number of times it has been seen that a whole lot of our emotional problems are a result of some trauma or non conducive experiences encountered in the past as children or young adults. If these experiences are not healed, it makes it difficult for us to lead a healthy emotional life. With this Meditation, We help the patient to get cured for insomnia, knight mare disturbances, restless sleep, isolation etc. Meditating on chakras with colors and mantras are regulating the rotation of chakras, expanding the aura, clearing the pathway for the kundalini energy . 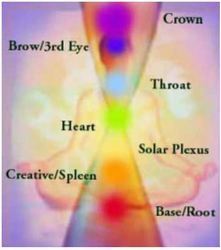 We conduct chakra conscious classes and help the patient to become aware of their chakra powers. Chakras are energy centers within the body. They act somewhat like psychic organs that produce and distribute energies throughout your being. In most people the Chakras are not active hence the lack of people who are aware of their intuitive and psychic sides. We venture into deeper realm of your problem area and explore specific areas in your life where you feel stuck. Reiki is offered as primary healing method paired with intuitive guidance and chakra meditation to heal Chakras and your Aura. The 7 Chakras are the energy centres in our body in which energy flows through. Blocked energy in our 7 Chakras can often lead to illness so it's important to understand what each Chakra represents and what we can do to keep this energy flowing freely.